The Jugs Soft Toss Machine for baseball or softball is the perfect training aid for any level player. The machine holds up to 14 baseballs or 10 softballs. With a weight of just 13 pounds you are able to take it to where the action is, whether that is in your backyard, basement, garage, gym or down at the ballpark for practice. This is an excellent training tool for both offensive and defensive drills, work on your top hand rotation or your footwork turning that double play. The machine runs on a rechargeable battery for up to 8 hours (charger included). The Jugs Soft Toss Machine also comes with a 24-page Toss Machine Drill Book and Throw-Down Home Plate. The perfect tool to get maximum swings in minimum time. 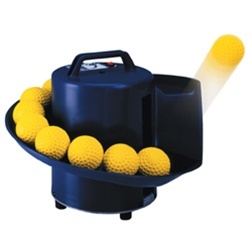 The Jugs Soft Toss Machine will automatically toss a ball every 5 seconds. Received the machine in less than a week, well packaged, ready to go right out of the box. Initial use went well with my 7 year old. We used the softer coach pitch baseballs and it tossed them at a good height for him. He also figured out that if he puts his Sklz trainer (wiffle type) balls in the machine it tosses them up high (enough for a 7 yr old) and he used it to practice catching pop ups. So far, so good. Great communication, even when it was not in stock, they were awesome at communicating on a regular basis. I would highly recommend this company !! Product arrived as outlined in order and was as described. Already put to use and is working great to focus on timing/contact with ball for maximum speed/force of hit.